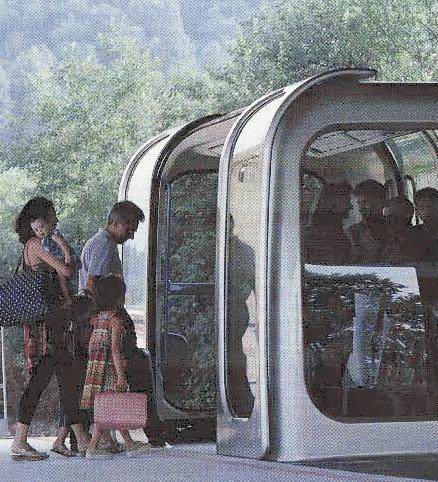 The SK transit system has been developed by Soulé, a French company that has been in the transit business since 1862. 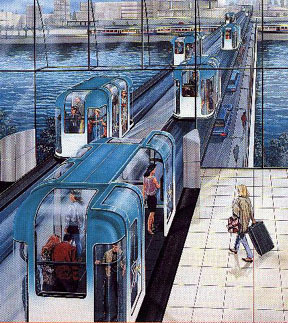 Development of the SK system, a cable-drawn automated, continuous people-mover was begun in 1981. 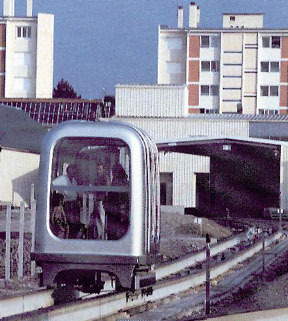 The first SK system offered service at the Villepinte Parc des Expositions in the northern Paris area in 1986. The second system was demonstrated at EXPO '86 in Vancouver, Canada and a third system was used by the public at an exposition in Yokohama, Japan, in 1989. In 1992, the Paris Airport Authority selected the SK system for the Roissy-Charles de Gaulle International airport and the first phase of this SK 6000 system is expected to be open to the public in mid-1996. A photo of the first generation SK vehicle is show below. 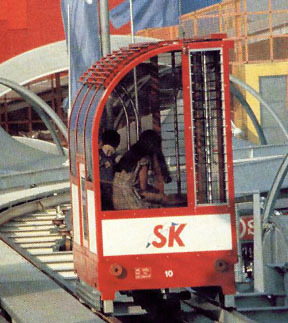 During the EXPO '86 exhibition, it carried 3 million passengers during a 6-month period with an availability of 99.1%. The capacity of this 150 meter elevated system was 1,700 passengers/direction per hour with a maximum speed of 15 km/hour and a minimum interval (between adjacent vehicles) of 26 seconds. Twelve vehicles were in operation in Vancouver. Each vehicle could carry as many as 12 people. The most extensive SK project to date is currently under construction at the Roissy-Charles de Gaulle International airport located just north of Paris. A two line system has been designed to transport passengers between the airline terminals, the parking lots, the TGV (high speed train) station and the RER commuter rail station which serves Paris. A diagram of the routes is shown below. Phase 1 of Line 1 will be 3,500 meters long and will connect CDG Terminal 1 (the international terminal) with the Interchange, a ground transportation hub located in the center of CDG Terminal 2 that serves both the RER commuter rail station and the TGV train station. The SK system will have 5 stations, a capacity of 2,900 passengers/hour/direction, a maximum speed of 36 km/hr, 38 vehicles in service, a minimum interval between adjacent vehicles of 36 seconds and a maximum trip time of nearly 9 minutes. The final phase of Line 1 will be 4,500 meters long and will include 79 vehicles. The capacity of the vehicles will be 29 and each will contain 4 seats. Line 2 was be completed in 1997 and will connect the various components of Terminal 2. As of March, 1999, it has not yet been accepted for public service and is way over budget. It will also be built in two phases, starting out at 865 meters and ending up with 2,800 meters of track. Initially, it will use 19 vehicles; later it will include 70. When complete, the maximum trip time will be nearly 8 minutes. The CDG airport is expected to serve 56 million passengers annually in 2005.